This is an old German custom, but an easy practice to implement in Lent. This is also known as the "Mary Candle." This is an old German custom. 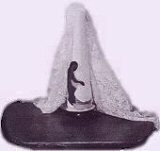 A large candle, which symbolizes the Blessed Virgin Mary from whom came the Light of the World, is placed in a white silk-covered candlestick. The candle is to be put on the home altar, and is lighted when the family gathers for their evening prayers every day during Advent.